For those who visit the Isle of Wight to view the special bus services operated for the annual music festival, this year look out for an NBfL 'New Routemaster'. The bus is visiting the Island as part of a publicity initiative to promote a special edition Fender guitar. Whilst there, the bus will be used on the special Festival bus services (probably mainly on the Newport service, but hopefully on other routes as well).The journey down is on Wednesday 10th June, and back on the following Tuesday 16th June. The bus will be in service on all days of the festival (Thursday to Monday inclusive). LT 100 is one of fifty-seven such buses based at Metroline Travel's Holloway bus garage in North London. 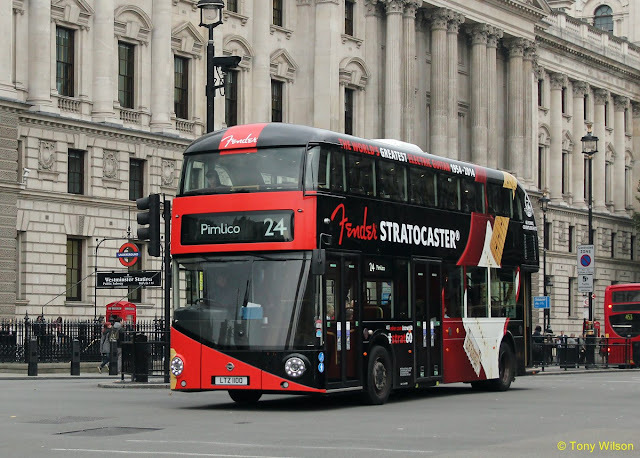 It is a regular performer on route 24 (Hampstead Heath & Pimlico) and sometimes on the 390 (Archway & Notting Hill Gate), and was chosen to feature an allover advertisement to celebrate 60-years of the Fender Stratocaster guitar. If you go there, do give the driver a wave and we are sure that he will respond in the required fashion!